"All-Solid Wood at Refreshing Price"
The Seagull Maritime SWS (Solid Wood Series) is an amazing quality guitar at a refreshing low price. Made with a solid mahogany body and a solid spruce top, this all-hardwood beauty contains no frills or furbelows. Instead it relies on simplicity of form and quality of craftsmanship to speak for it. This lovely lady’s wide neck and an organically mellow, mid-range sound lends itself well to fingerpicking. Yet it holds up well to regular picking style, and it comes with a pickguard to protect its beautiful semi-gloss finish. This guitar sounds especially great with bluegrass and jazz style play. Each and every note you play on the Maritime SWS is articulate. Strumming produces a full-bodied tone that completely fills your head, making this the perfect guitar for accompanying yourself or others on vocals. The Maritime SWS may be a bit heavier than other guitars you are used to; blame it on the solid woods. And its wide neck requires fingers that can find the reach. But a shoulder strap takes care of the weight. And if your fingers can manage the reach, the price is right for this all-solid wood guitar at ~$629. 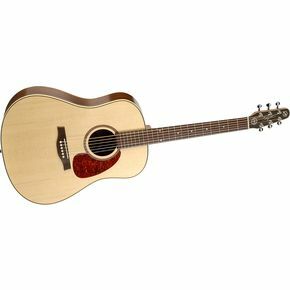 You will never regret choosing this all-solid-wood guitar at this refreshing low price, and you may very well find it becomes your guitar of choice. See more great guitar reviews at Seagull Guitars. These Quebec guys know how to make an outstanding instrument Cèst magnifique!!!! The Maritime is an absolute pleasure to play with a rich sound and clean, responsive action. It is the right guitar for Acadian, Irish and a host of other folk styles. I spent hours in a guitar shop trying everything on the wall and kept coming back to the Maritime. This was the best and yet the price was not the highest. Anyone looking to buy a new acoustic guitar has to try this brand.